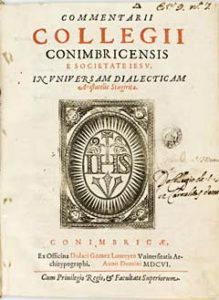 Being the only volume of the Coimbra Jesuit Aristotelian Course using two colours at its cover, red and black, the Commentarii Collegii Conimbricensis e Societate Iesu. In universam Dialecticam Aristotelis Stagiritae is a work by Sebastião do Couto (1567-1639), published in Coimbra, at the end of 1606, in the Printing House of Dias Gomes Loureiro, “Universitatis Architypographus” in two tomes (212x120mm). It should be mentioned that Sebastião do Couto was sent to teach philosophy in Coimbra (1601) after a previous experience of teaching it in the Jesuit University of Évora (1595/97). Beginning, this last book of the Coimbra Jesuit Aristotelian Course, with its necessary set of approvals dating from 29th July 1605, by Paulo Ferrer, and from 1st August, by Marcos Teixeira and Rui Piz da Veiga, acting on behalf of the Inquisition; on August the 4th, by Damião de Aguiar, on behalf of the Senate; and on the 15th of the same month, by the Bishop of Coimbra, Afonso de Castelo Branco, the last authorization dates only from 20th October, 1606, by the Provincial António de Mascarenhas, on behalf of the Father General, Claudio Acquaviva. This volume reproduces the King’s Privilege of 25th August 1572 which is the more ancient explicitly reference to the Portuguese Jesuits editorial enterprise – it is to be noticed that in the various volumes of the Coimbra Aristotelian Jesuit Course the King’s Brief Privilege appears with no date – stating namely that “no one can print, nor bring from abroad, any book whatsoever either composed, edited or translated by the Portuguese Jesuits”. Probably due to the counterfeit edition of the so-called Dialectica Furtiva – since it was assumed that was published in Frankfurt (Franco Furti) – this is the only volume of the entire Coimbra Jesuit Aristotelian Course that has been printed with a Preface to the Reader (Ad Lectorem). Firstly, Couto mentions the Dialectica Furtiva, written thirty years ago (scripta quidem ante annos triginta); consequently, the edition is justified, by stating that the volume had to be considered the authentic Coimbra Logic (verae Logicae Conimbricensis) and the last one of the Coimbra Jesuit Aristotelian Course, since Logic was the place to thwart numerous philosophical difficulties; thirdly, he alludes to a possible second edition of the volume of Physics expunged of a few conflicting opinions; fourthly, Couto justifies the omission of a few subjects that pertained to metaphysics as well as theology; then he explains his options regarding the Perihermeneias, Posterior Analytics, Topics and Sophistical Refutations, explicitly mentioning the introduction to logic by Pedro da Fonseca, being a work that may complement the brevity of the two latter titles (Couto was Fonseca’s aid in Lisbon between 1592-93); quoting in Greek the Aristotelian saying “Rhetoric is the counterpart of dialectic”, the Preface ends admitting that the subject matter related to dialectical syllogisms received a looser treatment. If one takes Manuel de Góis’ Preface, in the Physica, as the first theoretical foundation of the entire Coimbra Jesuit Aristotelian Course, the more than fifty pages by Sebastião de Couto’s own Preface to Logica may be read, in a certain way, as a revision of Góis’ rationale (see also the third reason of Couto’s Ad Lectorem). Due to its dimension the editio princeps of the Commentarii Collegii Conimbricensis e Societate Iesu, In universam Dialecticam Aristotelis Stagiritae was divided in two sets of pagination (divided between the books on Praedicamenta and De Interpretatione), that fulfils in its whole the total amount of 1059 pages (431+628), in this respect the largest volume of the Coimbra Jesuit Aristotelian Course. This is quite astonishing because Couto confesses, when dealing on Posterior Analytics (p. 518), that he would abstain of being too long since he was aware of writing a manual to schools (pro schola libellum).